Right-hander Carlos Carrasco worked into the seventh inning and kept the Mariners' bats at bay in a 3-2 victory for the Indians on Tuesday night at Progressive Field. Carrasco picked up his second win of the season for Cleveland after holding Seattle to one run on four hits in 6 1/3 innings. The big righty struck out five, walked three and allowed only a solo home run to Mariners third baseman Kyle Seager. "Every start, I just take a little bit from there. 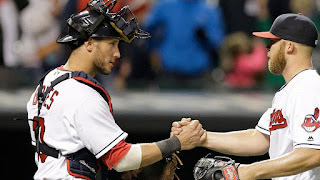 I kind of learn a little bit," said Carrasco, who is 2-0 with a 2.79 ERA on the season. "Sometimes you have to make an adjustment. That's what I did. I was trying to make my pitches." It was a solid enough showing to support the Tribe's work against Seattle left-hander Wade Miley, who represented the seventh southpaw Cleveland has faced in its first 11 games. Miley exercised solid damage control before losing his command in the fourth inning. Miley issued four walks, including two with the bases loaded, in that decisive frame. The southpaw ended with two strikeouts, and he was charged with three runs on nine hits in 3 2/3 innings. "I lost it. I don't know what happened," Miley said of his fourth-inning control issues. "I obviously didn't feel good going in, but I was able to make some pitches and got some ground balls early. But in that fourth inning, I just got to thinking -- something I don't do a whole lot -- and got mechanical and really lost it. That game is 100 percent on me. I have to do a better job to minimize right there." Beyond the run-scoring walks in the fourth -- one each for Rajai Davis and Francisco Lindor -- Mike Napoli contributed an RBI double off Miley. That two-base hit came with two outs in the third, scoring Lindor to give Cleveland an early 1-0 lead. Indians closer Cody Allen allowed one run in the ninth, but that was as far as Seattle's final push went. Allen sealed the win and notched his fourth save of the year. "I feel like we've played some pretty good baseball," Allen said of Cleveland's early-season showing. "We've played good baseball against good teams." Triple double: Miley gave up eight hits in the first three frames, but he limited the damage to just one run by inducing a trio of double-play grounders. The biggest was a 5-4-3 twin killing by Collin Cowgill in a one-out, bases-loaded jam in the second. But Miley also got Napoli on a hard grounder to Seager with runners on first and second to end the first. He then wiped out a leadoff single by Davis in the third when Jason Kipnis drove a shot right up the middle, where shortstop Ketel Marte was standing right behind the bag while playing Kipnis perfectly with the shift. Walk this way: Miley entered the fourth inning with no walks in 15 innings on the season, but that streak came to a crashing halt. With one out, the Mariners' lefty issued back-to-back free passes to Juan Uribe and Cowgill to load the bases. Miley then walked Davis and Lindor with the bags full to force home a pair of runs. The starter was pulled after throwing 20 balls in a 36-pitch span in the inning. "It was everything," Miley said. "I wish I could have found a pitch I could throw over the plate. I tried 'em all, they just weren't going. They didn't want any part of it. And I started rushing. I just have to be better. Point blank, I have to be better at the end of the day." Making progress at Progressive: Seager came in batting .119 and riding an 0-for-17 slump, but the third baseman has a history of hitting in Cleveland. That held true again as he went 2-for-4 and launched a homer in the sixth on a 1-0 changeup from Carrasco. Seager now has four home runs and is hitting .418 (28-for-67) in 17 games at Progressive Field. Feel the glove: Lindor and Napoli each turned in a highlight-reel play in the win for Cleveland. In the fifth, Lindor went into the hole at short to snag a grounder from Norichika Aoki. Lindor made a backhand grab and jumping throw to narrowly beat the runner at first. In the sixth, Napoli made a diving play to snare a sharply hit grounder from Robinson Cano. The first baseman recovered in time to flip the ball to Carrasco at the bag for an impressive out. "You don't see that play too often in the hole any more," Indians manager Terry Francona said. "And Nap has been good and continues to be. When you look at him, I'm not sure you realize how good he can move. He's into the game and it's been fun to watch." Twice during Tuesday's win, Francona and an Indians trainer met with Carrasco on the mound. It stemmed from a play in the third inning, when the pitcher ran to cover first base and slightly rolled his ankle upon reaching the bag. After Napoli's diving play in the sixth, Francona thought he noticed Carrasco limping again. After the game, both Francona and Carrasco downplayed the issue. The Indians went 4-for-9 with three walks with runners on base against Miley. In his first three games, the new Seattle starter has allowed opponents to hit .467 (14-for-30) with runners on base. In the first inning, Kipnis chopped a pitch up the middle, where Marte gloved the ball and made a quick throw to first for what was initially ruled an out by first-base umpire John Tumpane. Francona challenged the call, which was overturned following a replay review lasting one minute, 39 seconds. Kipnis was awarded an infield single on the play. Mariners: Taijuan Walker (0-0, 2.35 ERA) makes his third start of the season as Seattle continues its three-game series at Progressive Field on Wednesday at 3:10 p.m. PT. The 23-year-old right-hander was 2-0 with one run allowed in 14 innings in two starts against the Indians last year. Indians: For Game 2 of this three-game set with the Mariners on Wednesday at 6:10 p.m. ET, the Indians will give the ball to right-hander Danny Salazar (2-0, 0.79 ERA). Through two outings this season, Salazar has piled up 16 strikeouts against six walks in 11 1/3 innings. He struck out nine in six shutout innings in a win over the Rays in his last turn.